Rembrandt, seen with Saskia van Uylenburgh on his lap, is a frequenter of the Bar des Artistes. Here, Matthew Moss' inspiration is Rembrandt and Saskia (or, The Prodigal Son) in Dresden’s Gemäldegalerie Alte Meister, Staatliche Kunstsammlungen. 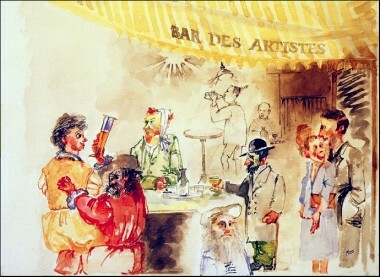 Amongst noteworthy frequenters of the bar are the elderly Leonardo da Vinci in the foreground, Rembrandt's inseparable friend Toulouse Lautrec with Vincent van Gogh and a barely noticeable Pablo Picasso in the background.